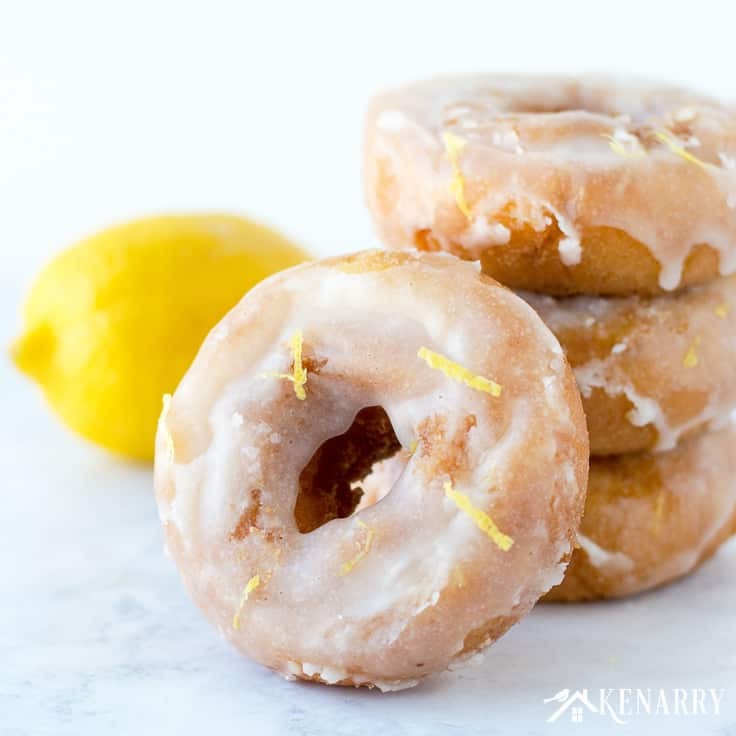 Create a delicious breakfast treat your whole family will love with this mouthwatering recipe for homemade lemon donuts. These tasty snacks would also be an easy dessert idea for a party or potluck! Learn how to make your own donuts with this delicious recipe we’re sharing today. 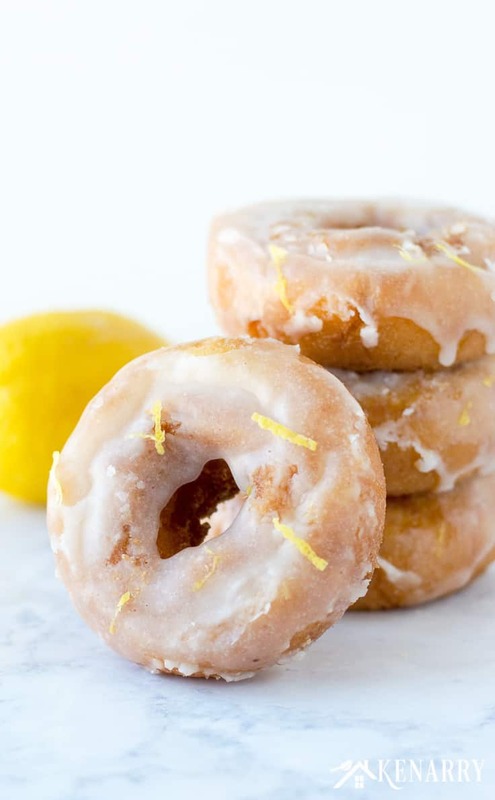 We’ll show you step-by-step how to make lemon donuts for your next brunch with family and friends or a breakfast potluck party at work. Brunch may very well be my favorite meal of the day. There are so many easy breakfast ideas — and you can totally serve brunch all morning long! I also love how breakfast foods can be savory like breakfast enchiladas or an egg casserole – or super sweet like pancakes or a french toast bake. Surprisingly though I’ve never tried to make my own donuts before, have you? Well, lucky for me, my friend, Meaghan from Cook. Craft. Love. is back on the blog today. This time she brought her easy recipe for homemade Lemon Donuts. I have been drooling over the photos and can’t wait to try making them with my boys. When it comes to easy breakfast recipes, Meaghan is an expert with great ideas like Cream Cheese and Cherry Toaster Strudels, Lemon Raspberry Sweet Rolls and Honey Vanilla French Toast Muffins. 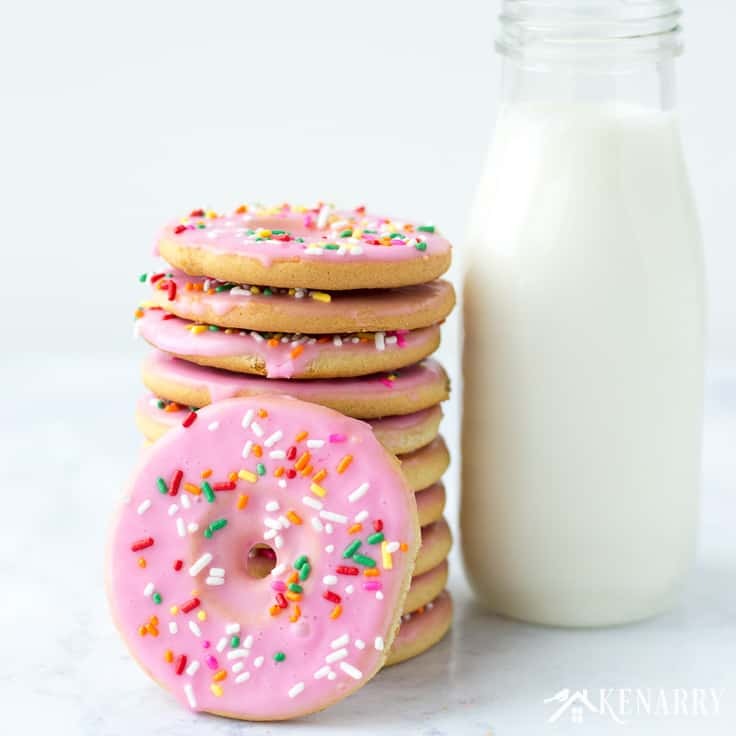 And did you see the Donut Cookies she shared with us on Kenarry last month? Okay, maybe those are more for dessert, but her recipes always look amazing! 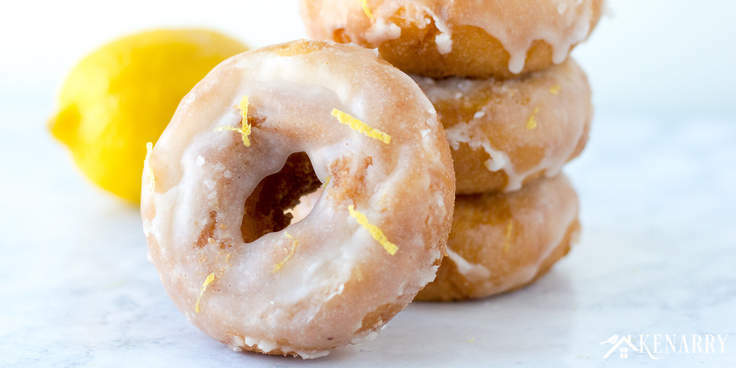 This delicious lemon donuts recipe will make 10-12 full donuts. So if you’re feeding a crowd, make sure you double it! 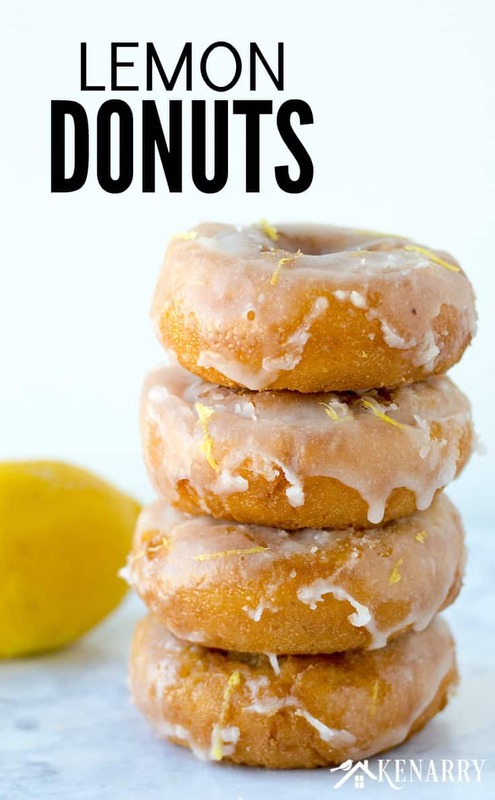 You’ll find a printable recipe card below the instructions if you want to keep this recipe to make lemon donuts again and again. First, form a paste by beating butter and sugar in your stand mixer. Then add the egg yolks and and continue mixing. Next, in a separate bowl whisk together the flour, cornstarch, baking powder, salt, and nutmeg. Then finally, add the dry ingredients to the wet ingredients in small portions, alternating with the sour cream. The important thing here is that you make sure you begin and end with the flour mixture. So you’ll start by mixing in a third of the dry ingredients followed by a half of the sour cream. After that’s mixed in, add another third of the dry ingredients followed by the rest of the sour cream. Then finally add the rest of the dry ingredients to the dough. 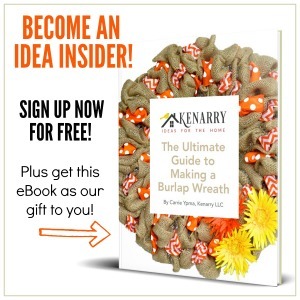 Form the dough into a big ball and wrap it tightly in plastic wrap. Put the dough for the lemon donuts in your refrigerator for at least one hour. Meaghan says it’s really, really important that you don’t rush or try to speed up this stage. The dough needs to be well chilled. 3. Cut the lemon donuts. Next, roll out the dough on a well-floured surface until it is about a 1/2″ thick. Then use a donut cutter to cut out the lemon donuts and holes. Meaghan says, if you don’t have a donut cutter, you can use two differently sized round cookie cutters for this step. 4. Pan fry the donuts. Pour 2″ of vegetable oil into a heavy bottomed pan. Heat the vegetable oil to 325 degrees. Use a candy thermometer to determine when you’ve reached the correct temperature. Carefully add the donuts into the hot oil one at a time. Let the lemon donuts cook for 2 minutes on each side, being careful not to crowd the pan. Remove the donuts from the pan and set them on paper towels to drain the excess oil. 5. 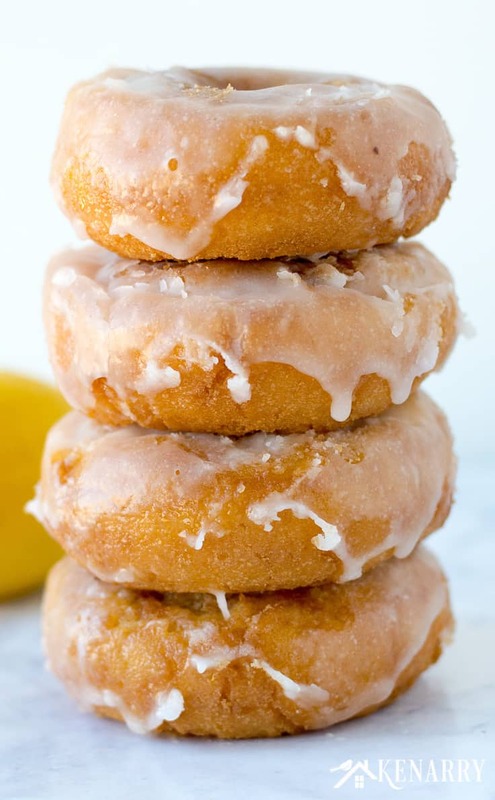 Glaze the lemon donuts. Whisk together the lemon glaze ingredients in a small mixing bowl. Next submerge donuts in the glaze one at a time until they’re completely covered. Then move each lemon donut to a wire cooling rack so that the excess glaze can drip off. 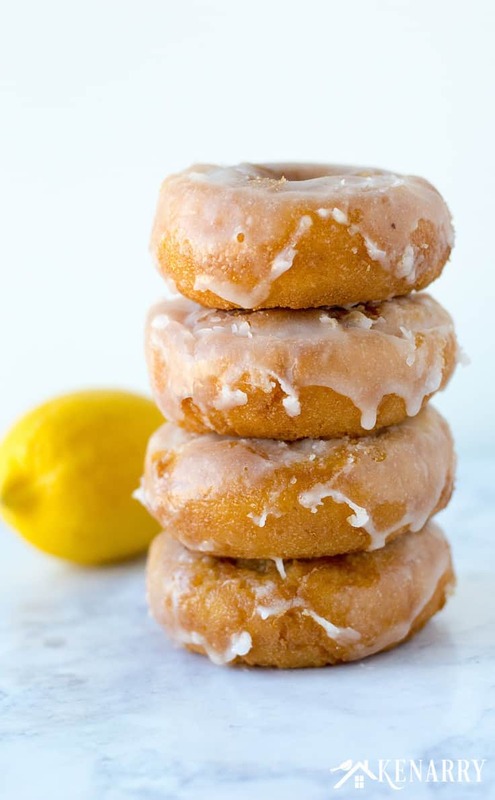 Allow the lemon glaze to set on the donuts for 20 minutes before serving and at least an hour before storing in an airtight container. Enjoy! Beat butter and sugar in a stand mixer until a paste forms. Add egg yolks and mix well. In a separate bowl whisk together the flour, cornstarch, baking powder, salt, and nutmeg. Add dry ingredients to the wet ingredients in three additions alternating with the sour cream. Make sure you begin and end with the flour mixture. Wrap dough tightly in plastic wrap and refrigerate for 1 hour. Roll dough on a well-floured surface about a 1/2" thick and using a doughnut cutter or two differently sized round cookie cutters cut out doughnuts and holes. Pour 2" of vegetable oil into a heavy bottomed pot and use a candy thermometer to heat it to 325 degrees. Carefully add doughnuts into hot oil and let cook for 2 minutes on each side, being careful not to crowd the pan. Remove to paper towels to drain. Whisk together glaze ingredients and submerge doughnuts in it until completely covered. Move to a wire rack so that the excess glaze can drip off. Allow glaze to set for 20 minutes before serving and an hour before storing. Why would you use egg yolk and not use the whites too?